There has not been much time to post in a few weeks. Quite a bit going on around here. Nothing really exciting. Just stuff…doctor’s appointments, paperwork, dog sitting…just stuff…life stuff. In the midst of all that life stuff, there have been a few moments found to be creative and have managed to do at least one piece each week for the Series 52 challenge. When the challenge first started, it seemed like it would be a good way to practice with watercolor and while there has definitely been some of that, it has also gone in other directions to the point where now, it is serving only to increase my creativity. If something worthwhile comes out of it, and a couple of things have, then all to the good but if not, at least I will have nurtured my right brain and worked outside my comfort zone. It has also given me ideas for a series or two of paintings that would be interesting to do. So, here’s what I have been up to…not sure of the weeks so I will just put them out here the way they were added to the challenge. The first two pieces were done on the computer and in the same week. 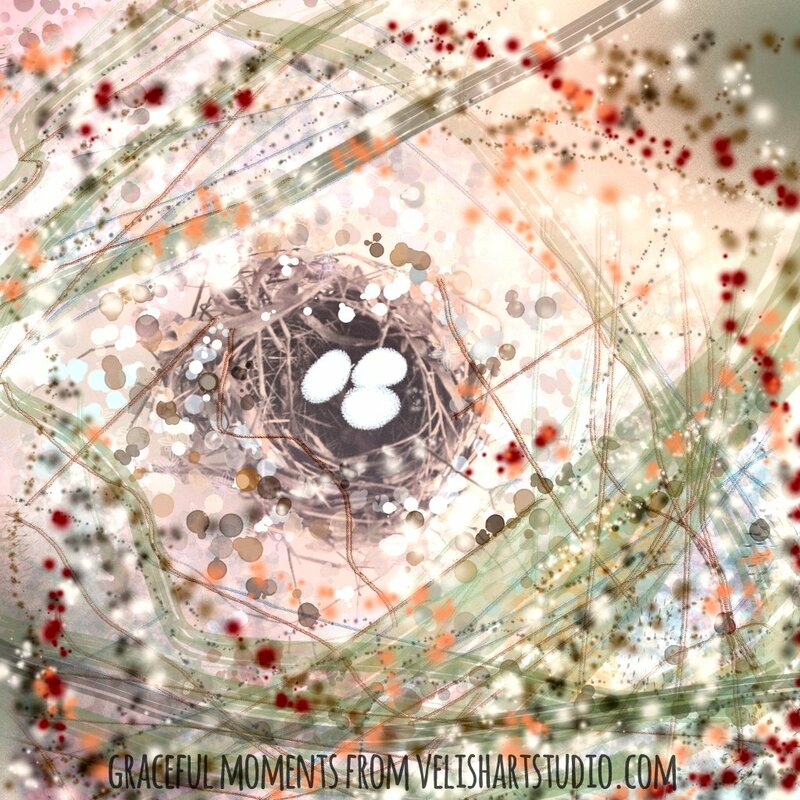 This was a photograph I had taken of a bird’s nest sitting on a glass table. The photo was rather boring so Photoshop to the rescue to add some eggs to the nest and some color and texture to the background. Bird’s Nest with Texture is nothing spectacular but it was a good refresher in Photoshop painting skills and turned an otherwise dull photograph into something a little more interesting. Do you ever just not want to get into the messiness of painting? It is a rare thing for me but one week I wanted to be creative but just did not want to make a mess. So, the computer and Photoshop were used to satisfy my creative urge. A “ginger” lady emerged from my screen. My grandmother had been on my mind a lot that day. She worked as a milliner in the early 1900s, before she was married. So, I thought it would be fun to add a big, crazy hat to this lady. This was done entirely in Photoshop. I also use Illustrator but prefer Photoshop for painting, probably because I have been using it for years and am a novice with Illustrator. Anyway, this was fun to do and no mess! 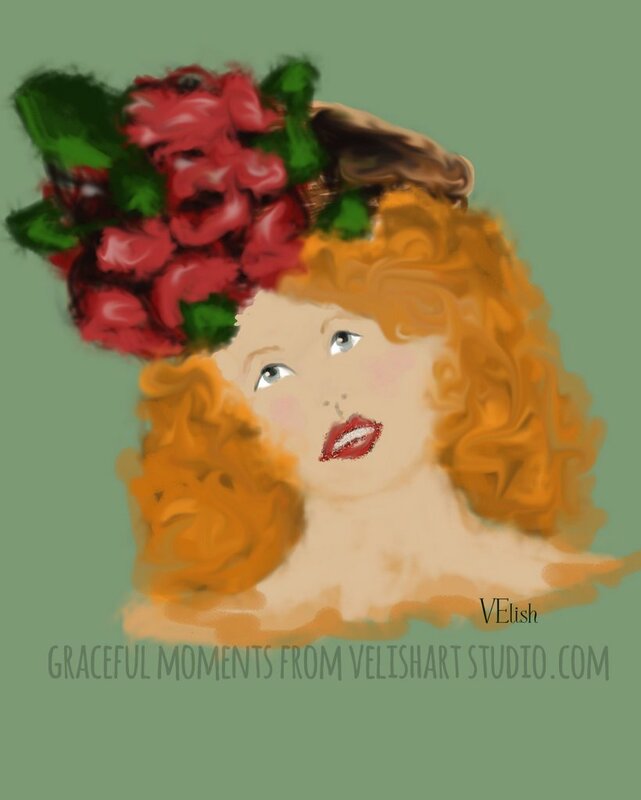 It also sparked the idea for a series of “Hat Ladies” in acrylic sometime soon. 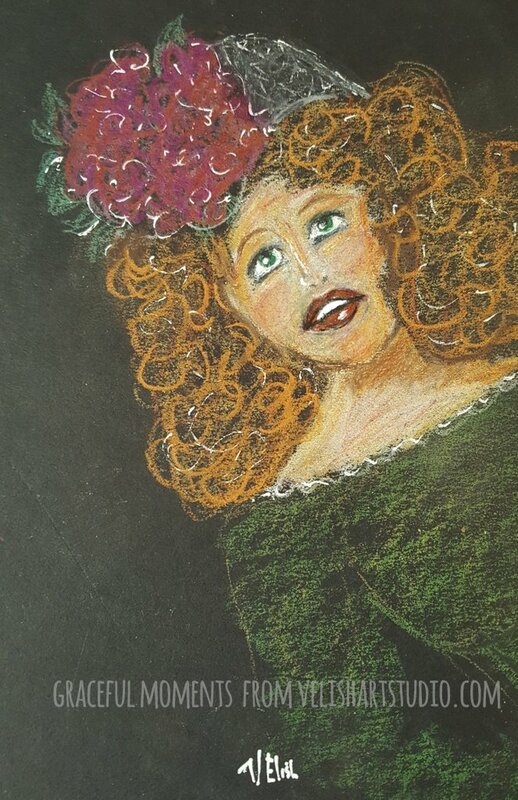 The next week my colored pencils were out for something else and found a piece of black mat board and decided to do a colored pencil version of the Lady with the Big Flowery Hat. This is how she turned out. The next piece was a more serious piece. I suffered from a major, clinical depression in 1995-1996. It was a terrible almost two years of my life. The primary source of the depression was determined to be an identity crisis. I had decided to retire from a company after 28 years. My identity was so wrapped up in my position as Vice President of that corporation, I had no idea who I was outside of that. All has been well since but I do remember how horrible depression is. 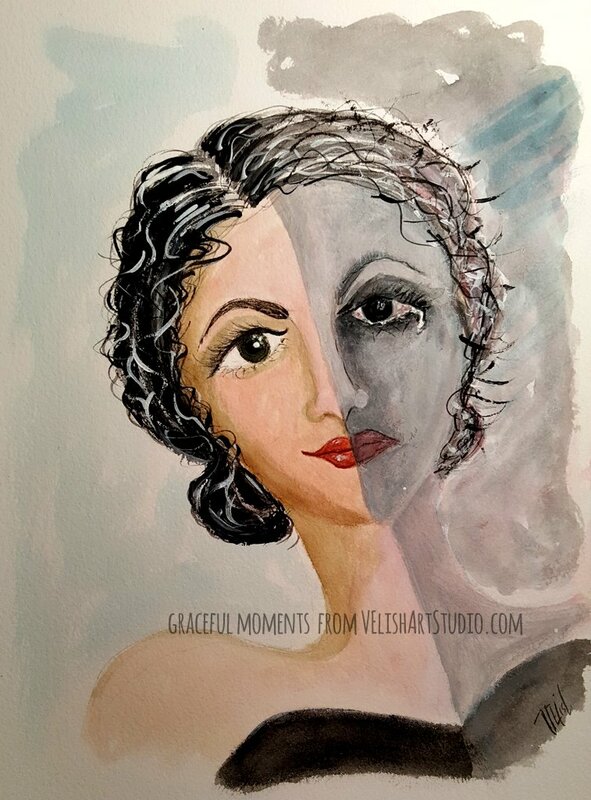 So, this piece, Broken, illustrates how you may appear completely normal, even happy on the outside (and have every reason to be) but inside you feel completely broken, ugly and spiraling into a black hole. Depression should never be taken lightly. Please, please seek help if you find yourself in this position. This painting resonated deeply with one of my dear friends and she purchased it. 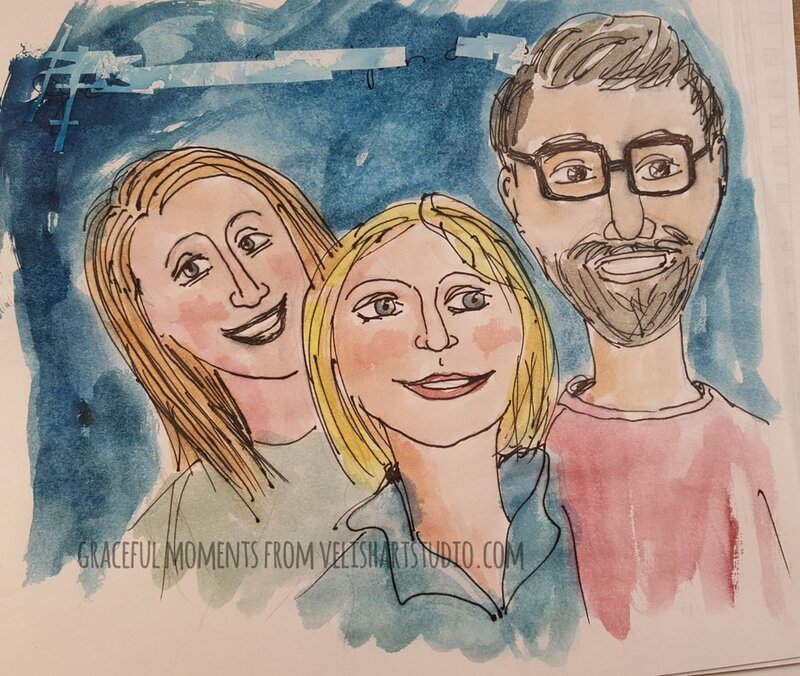 I have been trying to catch up on blogs I follow and while listening to a podcast the other day, I sketched some faces, then added ink and watercolor and came up with this little grouping of caricatures. This is not be included in the Series 52 but thought I would throw it in here to illustrate further that I am currently all over the place with my subject matter, medium, and style BUT I am being creative and that is all good. Previous Post A Painting a Week for a Year! Hello! It's good to see what you are doing-looks like lots of creative work. I'm so glad you are healed from your depression.